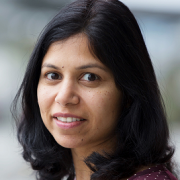 Vani Mandava is a Director of Data Science at Microsoft Research at Redmond with over a decade of experience in engineering teams designing and shipping software that in use by millions of users across the world. She is passionate about enabling academic researchers and institutions develop technologies that fuel data-intensive scientific research using advanced techniques in data management, data mining, especially leveraging Microsoft cloud and AI platform. She has enabled the adoption of data mining best practices in various v1 products across Microsoft client, server and services in MS-Office, Sharepoint, Online Services (Bing Ads) organizations and in the Academic Search service. She co-authored a book ‘Developing Solutions with Infopath’ and holds patents in service engineering. She leads Microsoft Research Outreach efforts at Data Science Institutions in US universities. She co-chaired KDD Cup 2013 and partners with many academic and government agencies including NSF supported Big Data Innovation hub effort, a consortia coordinated by top US data scientists and expected to advance data-driven innovation nationally in the US. She is currently leading the microsoftopendata.com project, a cloud based open data repository.